So my answer to my friend who asked me this question on my relationship with my spouse was ” I would love it to be Thiruchenkodu” … What is special about Thiruchenkodu is another story. When Daksha was performing a Yagna, he refused to invite Lord Shiva to the yagna(, nor did he offer any Havis(Oblations in sacrificial fire). Havis is a burnt offering that is carried to the deities through the medium of fire. Daksha’s anger being that Shiva was not suitable for Parvati. Parvati and Lord Shiva being the eternal lovers they were married without the parents approval like all lovers do. And like all women Parvati was still attached to that parents house she had left behind. She wanted to use the opportunity of a ceremony in parents house to bring the family together. She approached Lord Shiva and sought his permission to visit her father during the yagna. Lord Shiva was furious he was offended by Daksha’s arrogance. Like all offended men he wanted his wife to take his side by avoiding the ceremony. Parvati on other hand oblivious to her husband’s hurt pride was bent on going to her father’s house. She tried pleading her case by promising to advice her father and make better sense prevail. She would make him understand Shiva’s worth. Shiva sent her out with the words “If you have to go to your father’s place, You may not return to my house”. She leaves sadly caught between her love for her spouse and dedication to her father’s house. Hoping she can revive the whole bond if she succeeds in convincing her father to honor lord shiva. But like all women caught between two male egos she lost the fight at both ends. Her father was too arrogant to see what was at stake. In frustration she offers herself in the sacrificial fire. She reaches Kailash again to plead her way into her marital house. Shiva refuses to let her in. After a few beseeching requests. She loses her patience. She assumes she can get her way in through anger. Unfortunately it backfires on her. As shiva declares that he can live without Parvati for ever. 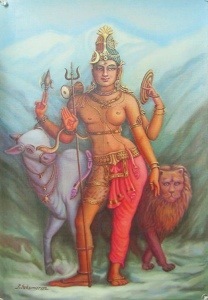 And Parvati passionately declares he can never be complete without her. A fierce fight starts between them. At the end Shiva burns her with his Moksha Jwala. Which burns her attachment with her family. Shiva too realizes that he is can never be complete without her. He gives her half of his body and becomes Ardhanareeshwara. You will find this form in Thiruchenkodu. We often are caught in the black and white when it comes to relationships. There are situations when both the beliefs are right in their own way and in such a situation the divinity in relationship blossoms only in healthy compromise. We discussed three forms of dampathyams. The ego of the mind wants us to proclaim one form of relationship to be superior to others. But karma doesnt bring two people together without a purpose. While boys cringe at the idea of having a dominating woman as wife, it can prove to be a boon to guy who needs that kind of guidance. While girls are afraid of becoming docile after marriage it can one of the sweetest things that can happen in a woman’s life. A healthy compromise is a beautiful thing that can happen in divine relationship between intellectually compatible partners.